Combine all ingredients and press into the base of a greased springform tin. Chill. Sprinkle gelatine over hot water. Stir to dissolve and allow to cool. Beat cream cheese and condensed milk until smooth, then beat in cream. Melt white chocolate. Allow to cool. Once gelatine and white chocolate are cool, beat into cream cheese mixture and spoon over biscuit base. Top with raspberries and gently fold through mixture. Yum. 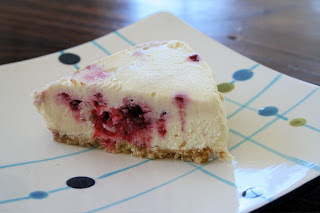 It's perfect not baked cheesecake weather!!! No need to turn the oven on! !